Fashion, health, environment, lifestyle, news or politics, there are many online magazines with interesting topics out there which are fun to read and surf through. In case you are planning to create a new online magazine or want to take your existing magazine to the next level, giving your website a new, fresh look is the first step towards your aim. 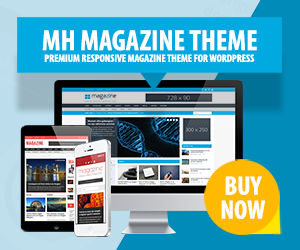 For any kind of online magazine, there is a suitable magazine WordPress theme. Some of these magazine WordPress themes lay their focus simply on design, others on great features, options and functions or combine it all. An online magazine is an informative source and replaces regular paper magazines more and more. Readers can access online magazines from their mobile devices at any time and are informed about latest news and new content immediately. If you want to publish high-quality content on a regular basis within your own online magazine or news website, then you can find lots of magazine WordPress themes for any content genre: beauty or fashion online magazines, dynamic news portals, tech magazines on latest gadgets or else. Apart from an appealing design, online magazines should be able to handle large amounts of content – articles with images, sometimes videos or else – in a well-organized and efficient manner. Image handling is an important aspect as well which can make your life easier and ensure to keep your website fast. Besides, SEO optimization of your magazine theme can contribute a great deal for your rankings in search engines. Publishing high-quality content on a regular basis is yet the most important aspect to successfully run online magazines or dynamic news websites.